The 2019 NCAA Tournament is upon us. After a thrilling Championship week that saw some teams come out of nowhere to earn bids to the Big Dance and other favorites sweep their way to titles, March Madness is here. Over the next two days before the Tournament tips off we’ll be taking a look at each of the four regions in the Tournament. We continue with the Midwest Region where the #1 seed is the North Carolina Tar Heels who are one of three ACC teams to earn #1 seeds this season. This region is laden with conference champions as 9 of the 16 teams won their conference tournament. 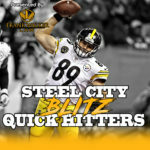 Don’t forget to sign up for our Steel City Blitz Bracket Challenge for a chance to win a t-shirt and koozie! North Carolina dropped 3 games between late November and the end of December, but came on to go on a big run through ACC play and finish tied for the regular season title. The Tar Heels swept a Zion-less Duke in the regular season then played an epic ACC semifinal where they fell on Zion’s tip-in. The Tar Heels are an excellent passing team, averaging 19 assists per game and are one of the top offenses in the nation, averaging 86 points per game. North Carolina has a dangerous trio of scorers in former Pitt guard Cam Johnson (16.9 PPG, 5.8 RPG), dynamic freshman point guard Coby White (16.3 PPG, 4.2 APG) and former walk-on Luke Maye (14.7 PPG, 10.5 RPG). North Carolina is a dangerous team who is absolutely capable of a deep run in March thanks to their dynamic offensive capabilities. Iona is making their fourth straight NCAA Tournament appearance after winning the MAAC Tournament. Interestingly, this was the first of those four times that the Gaels won it from the top seed. The Gaels are a high-scoring (76.8 PPG) guard-heavy squad and everyone is a capable outside shooter. EJ Crawford (17.9 PPG, 5.1 RPG) leads the way while point guard Rickey McGill (15.5 PPG, 4.6 RPG, 5.0 APG, 2.3 SPG) is the heart and soul of the squad. Tajuan Agee (13.3 PPG, 8.1 RPG) is the team’s sole big man and will likely draw the challenge of defending Luke Maye. Both of these teams like to play an up-tempo game and rank in the top 50 in the nation in possessions per game. Iona ranks in the bottom 75 in the nation in defensive efficiency so in all likelihood this will be a blowout but expect it to be played at North Carolina’s favored pace. Utah State was hovering on the edge of the bubble until a late-season victory over Nevada that they followed up by winning the Mountain West Tournament. Washington won the Pac-12 regular season title but fell to Oregon in the tournament final. The Aggies averaged nearly 80 points per game, led by Sam Merrill (21.2 PPG, 4.2 APG) and big man Neemias Queta (11.9 PPG, 8.9 RPG, 2.4 BPG). Utah State is not afraid to shoot 3s with anyone in their lineup and they rank in the top 50 in both offensive and defensive efficiency. This should be an interesting matchup between Utah State’s 3-point shooting and Washington’s matchup zone defense. Washington guard Matisse Thybulle (9.3 PPG, 2.1 APG, 2.3 BPG, 3.4 SPG) leads the nation in steals and has been the catalyst of the zone defense. On the offensive end, the Huskies have struggled to score at times, averaging fewer than 70 points per game. Jaylen Nowell (16.2 PPG, 5.3 RPG, 3.1 APG) leads the way with David Crisp (12.5 PPG, 2.8 APG) and forward Noah Dickerson (12.2 PPG, 7.4 RPG) contributing significantly. Auburn was a team that the metrics loved for much of the season but their resume lacked a signature victory. That win came in the regular season finale when the Tigers beat Tennessee, head coach Bruce Pearl’s former team. Things broke well for the Tigers in the SEC Tournament and they won 4 games in 4 days, including a 20-point shellacking of Tennessee in the SEC Championship. Auburn enters the NCAA Tournament having won 8 in a row. Auburn is led by the backcourt tandem of Bryce Brown (15.8 PPG) and Jared Harper (15.2 PPG, 5.8 APG). Chuma Okeke (11.7 PPG, 6.8 RPG) is the team’s leading rebounder. Auburn’s top 3 scorers all shoot over 38% from beyond the arc and the Tigers can score in bunches (79.4 PPG) thanks to their 3-point shooting. As with some of the matchups in the South Region, the lower-seeded team here has a significant geographic advantage of about 1000 miles. New Mexico State is also a quality offensive team that averages 78.1 points per game. The Aggies might be the deepest team in the Tournament and have 13 players averaging double-digit minutes per game. Point guard AJ Harris (9.6 PPG, 3.4 APG) is the only player averaging more than 25 minutes per game. Given their deep lineup and rotation, only one player averages scoring in double-digits (Terrell Brown, 11.3 PPG). New Mexico State plays at a relatively slow pace and given their depth could create the atmosphere for an upset. Kansas was given an absolute gift by the Committee when they were placed in the Midwest Region. The Jayhawks have to go to Salt Lake City for the first and second rounds, but the regional finals are in Kansas City which is just 40 miles from their campus. Kansas has dealt with the ineligibility of center Udoka Azubuike and the departure of sharpshooter Lagerald Vick. The remaining lineup remained strong in Phog Allen and made a run to the Big 12 title game but struggled significantly on the road. Dedric Lawson (19.1 PPG, 10.3 RPG) and Devon Dotson (12.1 PPG, 3.6 APG) have taken on a significant load of the team’s scoring. Kansas’ strong suit is their defense where they rank in the top 15 in the nation. This is a matchup of strength-on-strength as Northeastern ranks in the top 50 in offensive efficiency and averages 76.1 points per game. The Huskies won the CAA tournament, defeating top-seeded Hofstra. Vasa Pusica (17.8 PPG, 4.2 APG) won the CAA tournament MVP. Northeastern has a guard-heavy lineup and ranks in the top 20 in the nation in 3-point shooting. Pusica, Jordan Roland (14.7 PPG), and Bolden Brace (10.0 PPG, 6.0 RPG) all shoot over 40% from beyond the arc. This makes Northeastern a dangerous team that is capable of pulling an upset if they can find open shots against Kansas’ defense. Iowa State was one of the top 16 teams in the Committee’s initial bracket reveal in early February. However, the Cyclones went through a disastrous month where they went 2-6 to finish the regular season. Despite losing their last 3 regular season games, Iowa State turned it on when it mattered and won the Big 12 Tournament. When they are on their game, Iowa State has one of the most dynamic offenses in the country, ranking in the top 10 in efficiency and averaging 77 points per game. A trio of guards lead the way in Marial Shayok (18.6 PPG), Lindell Wigginton (13.5), and Talen Horton-Tucker (12.1 PPG). Ohio State similarly backed into the postseason after a hot 12-1 start through the end of December. But the Buckeyes lost 5 in a row to start the new year. After nearly getting back to .500 in conference play by the end of Febraury, they lost their last 3 regular season games. A win over Indiana in the Big Ten Tournament kept the Buckeyes (barely) in the tournament conversation and landed them just above the play-in games. Ohio State is not a great offensive team (69.6 PPG) and they rely heavily on Kaleb Wesson (14.4 PPG, 6.8 RPG) and CJ Jackson (12.2 PPG, 3.5 APG) for offensive production. Houston was a buzzer-beating 3-pointer by Michigan away from the school’s first Sweet 16 appearance since the Phi Slamma Jamma team of 1984. This year’s Houston squad cruised through the AAC and is very capable of making a deep run in the Tournament. The Cougars rank in the top 25 in both offensive and defensive efficiency. Their offense comes primarily from the backcourt as their top 5 scorers are all guards, led by Corey Davis (16.7 PPG) and Armoni Brooks (13.6 PPG, 6.5 RPG). Houston is a deep team and has 9 players averaging over 13 minutes per game with only 3 players (Davis, Brooks, and Galen Robinson) playing more than 20 minutes per night. Despite having just 1 player (Brooks) averaging more than 5 rebounds per night, the Cougars are 3rd in the nation in team rebounding as everyone crashes the glass together. Their depth will be an asset in the tournament. While Houston will go 9 deep, Georgia State relies heavily on their starting lineup. The Panthers have a strong offense (77.2 PPG) but most of it comes from their starters, led by D’Marcus Simonds (18.4 PPG, 5.0 RPG, 3.7 APG) and Malik Benlevi (12.1 PPG, 5.8 RPG). Georgia State won the Sun Belt Tournament from the top seed, taking advantage of the atypical bracket which gave the top two teams byes to the semifinals. The Panthers have won 8 of their last 9 since a 2-game losing streak in early February. Georgia State rates outside the top 100 in both offensive and defensive efficiency, but does like to play an up-tempo game. Look for Houston to slow this one down on the offensive and defensive ends and force Georgia State out of their comfort zone. Wofford ran through the Southern Conference with a perfect 18-0 record in conference play and followed it up by winning the SoCon Tournament. The SoCon was a tough conference which featured a UNC-Greensboro team that was the first team out of the NCAA Tournament and a Furman squad that beat Villanova early in the year. Wofford features Fletcher Magee (20.5 PPG) who shoots 43% from beyond the arc and is 3 3-pointers shy of the all-time collegiate record. The Terriers also have quality complementary scorers in Cameron Jackson (14.6 PPG, 7.6 RPG) and Nathan Hoover (13.3 PPG) in an offense that averages 83 points per game. Wofford is also the top 3-point shooting team in the Tournament at 41.6% as a team. The Terriers did get a bit of a tough draw in a Seton Hall team that made a run to the Big East Tournament final and lost by just 2 to Villanova. Myles Powell (22.9 PPG) led the way in the Big East Tournament. Most of the Pirates scoring comes from their backcourt. In addition to Powell, Myles Cale (10.3 PPG) and Quincy McKnight (9.5 PPG) are the leading scorers. This game has the potential to turn into a mano-a-mano showdown between Powell and Magee.